The Sea Isle is a petite, rectangular fiberglass swimming pool. It includes a wide set of bench seating leading & corner entry steps. Lastly, its flat bottom design makes it extremely comfortable for cooling off and soaking for water therapy. If you’re looking for a simple, straight forward swimming pool – the Sea Isle is just the ticket! 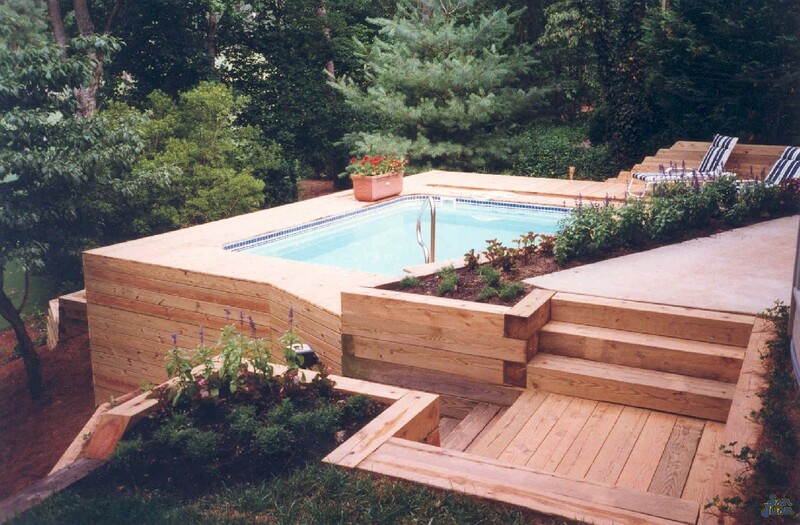 This fiberglass swimming pool features radius corners, a flat bottom design, wide bench seating & corner entry steps. 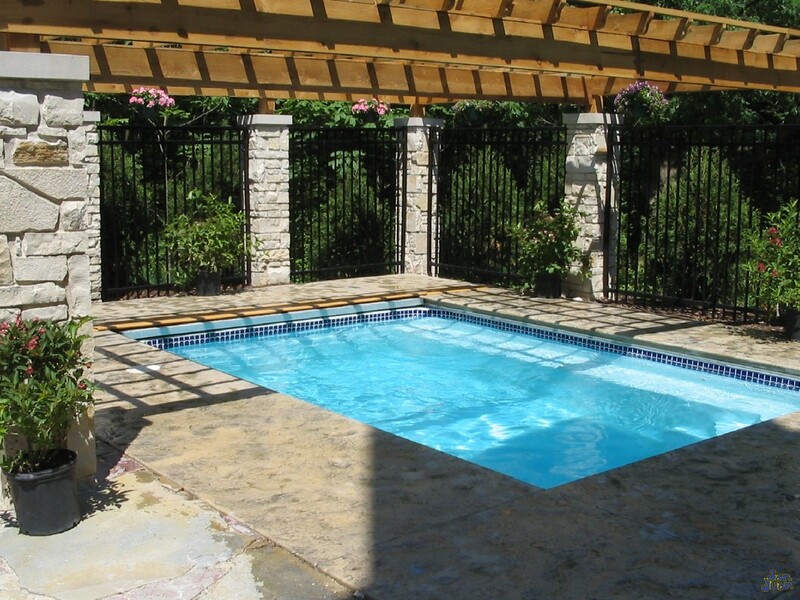 At San Juan Pools, we design our swimming pools to support a wide range of activities and lifestyles. 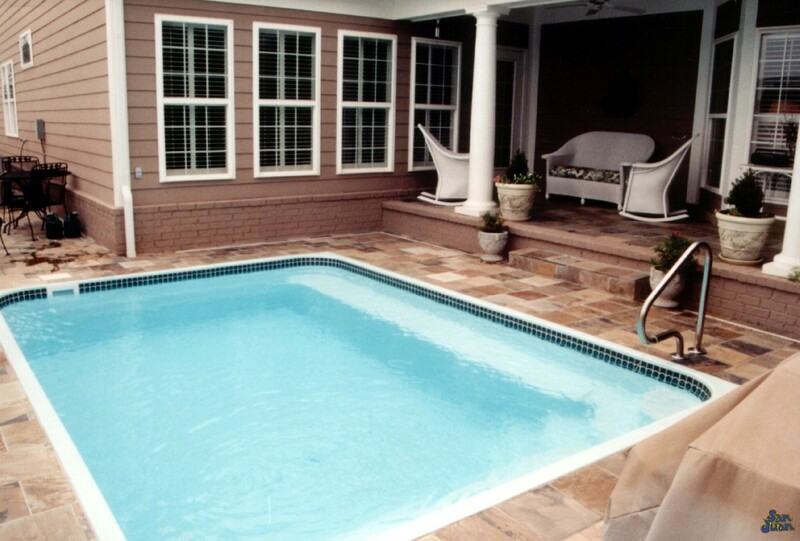 In the case of the Sea Isle, we designed this swimming pool for comfortable soaking and water therapy. The idea here is comfort. We want our guest and swimmers to have easy access to their pool. Secondly, what’s better than offering a wide bench seating to host a party of close friends? 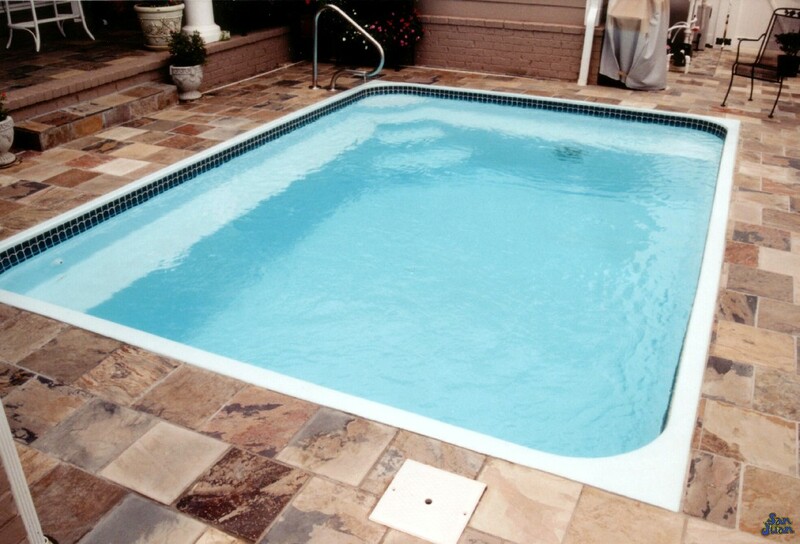 Take the initiative and heat this petite fiberglass pool with a natural gas or propane pool heater. This will allow for nearly year round use and boost the quality of your backyard living space! Designed for comfortable swim sessions, the Sea Isle does not provide any deep end. Instead, we’ve constructed a consistent depth of 5′ across the pool floor. This is a great way for users to navigate across the pool for water aerobics and physical therapy. Its flat bottom construction also makes this swimming pool extremely safe for those with less mobility. Secondly, its total width of 12′ allows the swimmer to access the edge of the pool for added support during swim sessions. Alas, we want our swimmers to have easy access to get in and out of our San Juan Pools. Therefore, we’ve installed a convenient corner step in between the wide bench seating. This provides the user a safe and accessible way to enter and exit the pool with relative ease and safety. 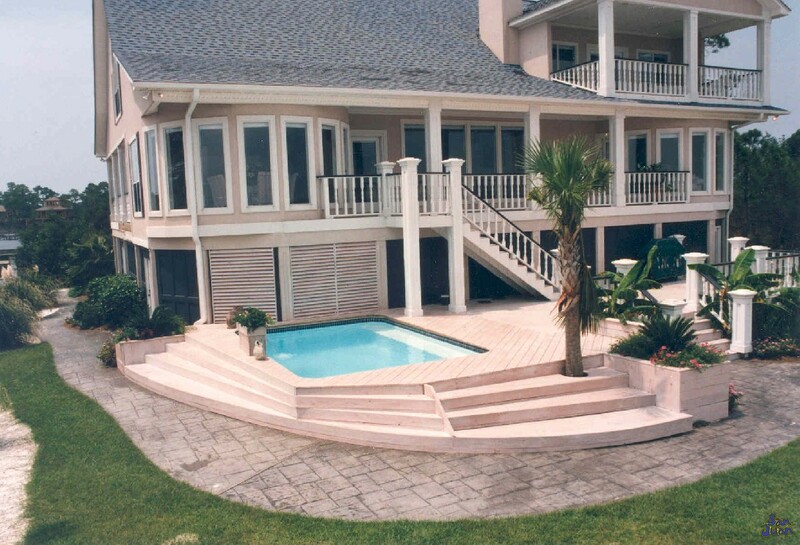 We recommend adding a handrail to the pool deck for both aesthetics and an added safety feature. For those with sore joints and knees, a pool handrail is a great add on that is certainly well worth the investment. In conclusion, the Sea Isle is a gorgeous rectangular pool shape. Designed for comfortable swimming, soaking and water therapy – it’s a very convenient swimming pool that boosts health and comfort. It’s petite size also makes it extremely easy to install in almost any backyard or indoor space. 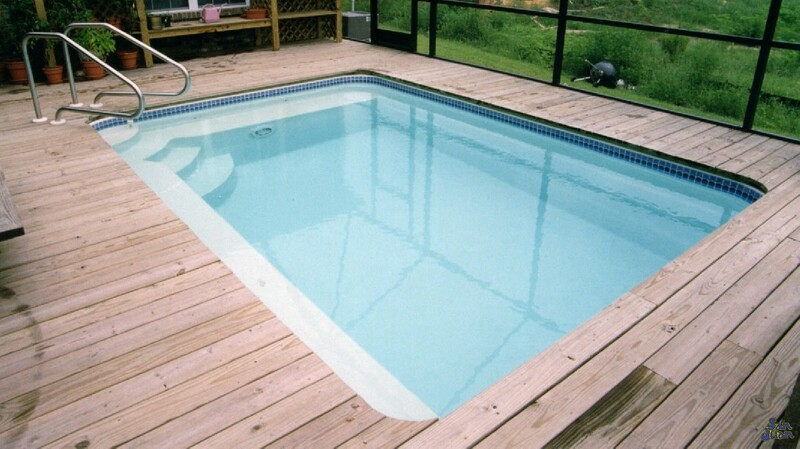 Therefore, this is a great fiberglass swimming pool for nearly any consumer!